Pastor and former mayoral candidate Rev. Amir Khan (right), community activist and blogger Vida Neil (center) and Camden County NAACP president Kevin Barfield (left) hold a press conference outside the Camden Board of Education after meeting with acting superintendent Katrina McCombs (not shown) April 10, 2019. They reacted to the possibility of the school district closing two schools and an annex, cutting 300 jobs and relocating about 900 students to help close a $27 million budget deficit. We had quite a few fair weather days this week and it seems like there were a few fair weather fans at the Wells Fargo Center yesterday when the Sixers lost Game 1 in their playoff series against the Brooklyn Nets. Ben Simmons did not appreciate all the boos. Now this spring weather is forecast to turn to thunderstorms tonight. Perhaps it’s just setting the scene for a certain TV premiere everyone is talking about. The Sixers may have lost their first game of the series, but it ain’t over 'til it’s over. They face the Nets at home for Game 2 tomorrow night at 8 p.m. The Phillies also had a rough Saturday: they got thumped by the last-place Marlins. They have a chance to redeem themselves this afternoon. Tomorrow is Tax Day! We have some tips for those who’ve waited until the last minute. PATCO’s new weekday schedules kick into gear Monday. If you miss your usual train, have no fear: the shift includes more-frequent service for early-morning riders. A redacted version of special counsel Robert Mueller’s report on Russian interference in the 2016 U.S. presidential election is expected to be released this week. Pastor and former mayoral candidate Rev. 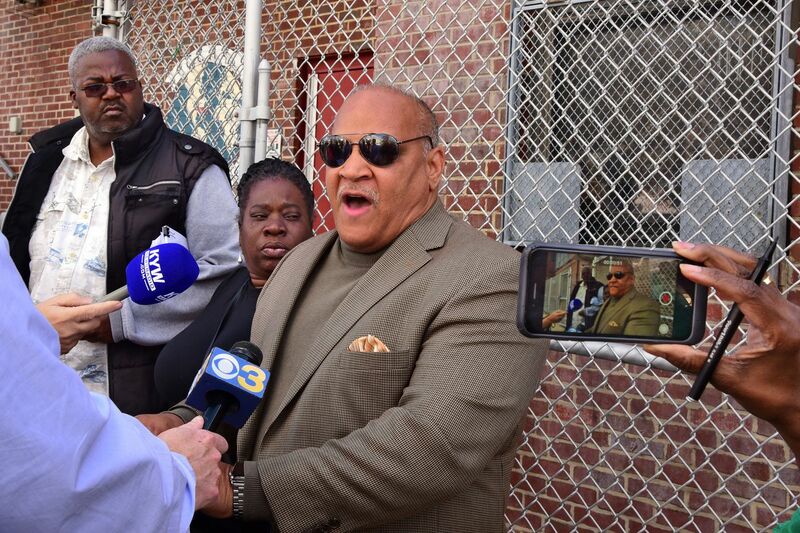 Amir Khan (right), community activist and blogger Vida Neil (center) and Camden County NAACP president Kevin Barfield (left) hold a press conference outside the Camden Board of Education after meeting with acting superintendent Katrina McCombs (not shown) April 10, 2019. Each week we go behind the scenes with one of our reporters or editors to discuss their work and the challenges they face along the way. This week we chat with Inquirer reporter Melanie Burney about changes coming to the Camden City School District, which is facing a $27 million budget deficit. This week the district’s acting superintendent announced it may close two schools and an annex, relocate about 900 students, and cut several hundred jobs. Describe the gravity of this situation. How much will these cuts disrupt the Camden community? The cuts are the results of grave fiscal concerns and if implemented would have a major impact on the district, affecting about 900 students and possibly as many as 300 employees who could be laid off. The cuts would reconfigure schools and some students may be forced to travel to schools outside their neighborhoods. For example, students at Riletta Cream School in the Centerville section will be sent to H.B. Wilson and Creative Arts. Also in jeopardy with possible reductions or cuts are summer school, athletic and extracurricular programs. Acting superintendent Katrina McCombs cited that, even if the school district closed its budget gaps, it wouldn’t address long-term enrollment issues. Describe the enrollment landscape at Camden County Schools. Are parents sending children elsewhere? Camden is a public school system that offers three options: traditional public schools, charter schools, and Renaissance schools. Due to a major landscape change, more Camden public school students are enrolled in charter schools and Renaissance schools than traditional public schools. In 2000, the traditional schools educated nearly 19,000 students in more than two dozen schools. The demographics changed drastically as parents had more options and chose to send their children to charters and Renaissance schools, which are publicly funded and privately operated. Are there any instances where you see the school district avoiding job cuts? What are other solutions that have been proposed, or what other solutions have worked elsewhere? Superintendent McCombs has indicated that cuts are unavoidable, even if the district obtains the $27 million needed to close the budget gap. Some of the job losses may be reduced through attrition and retirement. But that will not solve the long term enrollment and facilities issues the district faces. Other districts, typically, turn to voters to support a tax increase or bond referendum. That is not an option in Camden, one of the poorest cities in the state, that relies heavily upon state aid to operate its schools. What comes next, and what will you be keeping in mind as you stay on top of ongoing developments? Activists and school officials are hoping the state will provide additional aid to close the shortfall. The budget is being finalized, so the numbers could change. The district has until May 15 to notify any impacted employees if their positions will be eliminated. McCombs plans to meet with staff, parents and community members to get feedback to discuss the closures and school configuration plans. You can contact Melanie Burney via email at mburney@phillynews.com or on Twitter at @mlburney. #CuriousPhilly: Have a question about your community? Ask us! Have you submitted a question to Curious Philly yet? Try us. We’re listening to our readers and doing our best to find answers to the things you’re curious about. Check out all the questions we’ve answered so far, thanks to suggestions from readers like you. Eating: Rigatoni with smoked chicken at Cry Baby Pasta, an Italian spot “that’s roared to beautiful life in the form of a bright new neighborhood hub,” according to Inquirer restaurant critic Craig LaBan. Drinking: Springtime cocktails on the last day of Philadelphia Distilling’s enchanted garden pop-up bar, The Betsy. Watching: Game of Thrones, obviously. It returns tonight at 9 p.m. on HBO. Listening to: Nat Turner Rebellion, the Black Power-era Philly funk and soul group whose debut album was finally just released nearly 50 years after it was recorded. “Developers should not be able to evict people, tear down buildings or dig pits without concrete plans to build something including a bond with the city or in escrow that would allow the area they ruin to be rebuilt or healed if they fail. Let’s look at the pit across from the Kimmel - a disaster. We don’t need something similar on Jeweler’s Row.” — Whattheheck, on Several Jewelers Row tenants receive eviction notices, even as Toll Brothers’ Philly high-rise plans remain unclear. The Arizin cousins play for St. Joe's Prep. They are the grandsons of the late basketball hall of famer, Paul Arizin, who stared for Villanova and the Philadelphia Warriors. Michael Arizin, father of Gabe Arizin, expresses his displeasure in the stands during PrepÕs Catholic League playoff game against Roman Catholic on Feb. 15, 2019. For the Arizin family basketball is life, from NBA Hall of Famer Paul Arizin’s legacy to two of his grandchildren playing together at St. Joseph’s Prep.